Is a powerful immune-booster. It is very effective against bacterial, viral and fungal infections. Garlic contains a compound known as allicin, which has been shown to help lower cholesterol levels, prevent blood clotting, and has been shown to have anti-cancer properties and anti-microbial The antibiotic qualities of garlic appear to be a direct result of the allicin produced from raw, crushed garlic. This is destroyed by age and cooking – cooked garlic has virtually no antibiotic value although it still retains other benefits. Garlic is low in calories, but high in nutrients, containing Manganese, Vitamin B6, Vitamin C, selenium and fiber. One study found that a daily dose of garlic reduced the number of colds by 63%, while reducing the average length of cold symptoms by 70%. Helpful hint: When infused with honey, raw garlic becomes far more palatable. Yummy even! So keep a jar of this on hand at all times in your refrigerator so you will be prepared for winter (or the next time you start to feel sick). This garlic is ready to eat after a few days but tastes even better over time. You can replace the garlic cloves with fresh ones whenever you take some out, so the jar remains full at all times and the honey becomes saturated with garlicky goodness. Peel the cloves removing the outer layer. 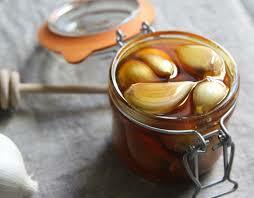 At the first sign of illness, eat one clove of honey garlic every hour or two. By the spoonful, the honey alone is a wonderful cough suppressant. It’s also soothing and coating to sore throats. Mix one tablespoon of the honey, one clove of garlic, 2 TBSP raw apple cider vinegar (or the juice of one lemon), add hot water and drink this as a tonic when you’re sick. Add a pinch of cayenne pepper – this is excellent for opening up your sinuses.